In 1995, the year before Dominica's first appearance in the Olympic Games at Atlanta, U.S.A, we participated in the Pan-American Games for the first time in Mar del Plata, Argentina. That was 21 years ago, and the very fact of our most encouraging debut on the world scene led us to believe our expectations should then have been geared towards very serious and progressive development. At least in track and field- this being the prime discipline in which our athletes had featured creditably at both those two international events. Added to this, Jerome Romain had secured the bronze medal at the World Games in the triple jump at Stockholm in addition to his silver at the Pan American Games in Argentina. Very really, the future was considered bright – it being only a matter of application of effort along the right lines. What might be considered pertinent was the daunting fact that the Dominica Olympic Committee had to buckle down to the task of raising as much as (E.C) $130,000 to send our team to the Atlanta Games. In relative terms that sum would equate to around $300,000 to $400,000 under a post inflationary effect. It is perhaps unfortunate that our long endemic outlook has been to wait in the hope that outstanding athletic performers would drop from the sky into our laps – maybe in answer to a prolonged act of faith, very much without works. Alas, the ensuing death warned by the pertinent biblical edict has continued to stay with us. No amount of sending a few youngsters to the Olympic Games of Athens and Sydney and to the Youth Olympic Games etc has made anything of a difference. After all, we have done all this while grossly ignoring a need to come to grips with one essential: that of working conscientiously to bring our athletes up to the required entry standards of these games. I would be the last to deny the vital need for a national athletics track of approved international standard to be made available here in Dominica. But I look upon it more as icing on the cake. The cake itself is a paramount need, and we should endeavour to have it within our grasp. There used to be a time when international athletic authorities would allow a differential of about three seconds, for instance in the time envisaged for the men's 400 metres on grass as compared to a synthetic track. Thus, 48 seconds achieved on grass would equate with 45 seconds on the synthetic surface. In fairness to our young aspiring athletes we ought not simply to throw up our hands in the air, saying there is no hope for them until a synthetic track becomes available here. There is much we can do – well beyond what we have done in the past many years. Much of what we need is an absolute change of the mental outlook towards progress and development. The late Bill Sykes of England, who worked assiduously with athletes in St. Lucia, was adamant that most of our youths while at school only showed improvement in their performances largely as an outcome of increased physical growth than because of improvement in quality of the training effort. We see this often with some potentially outstanding school athletes who predictably lift their long jump from 12 feet to 14 feet to 16 feet at the respective ages of 12, 14 and 16 – but the barrier remains, preventing breakthrough to 18 feet, 20 feet and 21 feet in later years. Let us not simply presume that the longed for progression is an automatic one. There are things obviously needed to be put in place to facilitate progress. However, Jerome Romain had done around 25 feet in the long jump while still at the Portsmouth Secondary School – before proceeding to college in the U.S.A where he continued to make further progress propelling him to international competition. Similarly, Dawn Williams was displaying solid proficiency in the 800 metres before she went over to college in the U.S.A. The same may also be said for Cedric Harris 800 metres, Stephen Agar 1,500 metres and Hermine Joseph 100 metres and 200 metres. All our youths seeking to follow in their footsteps would need to have quality grass tracks at their disposal – mandatory between the ages of 10 to 15. It is on these facilities, hopefully provided as part and parcel of our community playingfields, our youth can place foot on the steppingstones leading on to our premier national athletics track. Rio has gone past us without our getting to the starting post. The next Pan American Games is in 2019 before the Tokyo Games in 2020. It is a four year span summoning us to commence work rather than bewailing all the years lost between Atlanta and Rio. In the early eighties our Sports Division took it upon itself to arrive at a list of athletes from the secondary schools who had shown promise in the Secondary Schools Independence Games. 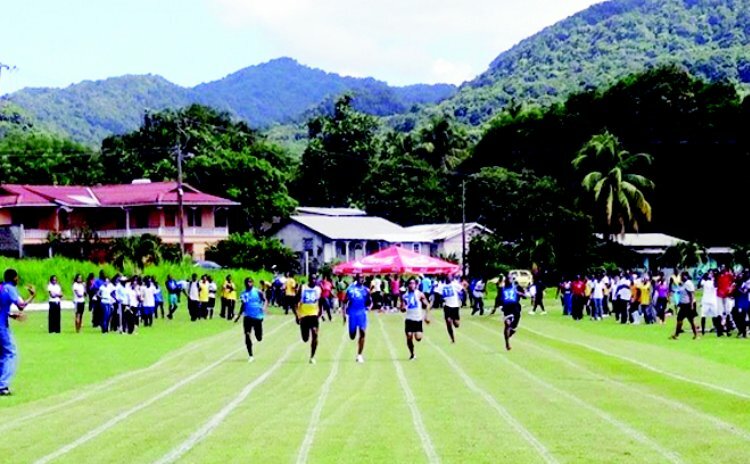 That was how Bruce Phillip (400 metres), Cedric Harris (800 metres) and Stephen Agar (1500 metres) came to the fore under extended training for the junior CARIFTA Games. We need to go back to this approach, using the experience which should have evolved from that time. It is a challenge our schools should not miss. The athletes mentioned above proved to be three out of a full thirty-six who endured the training programme mentioned. The benefit of television of today should see drastic escalation in patriotic response in this day and age coming from our students. In this regard also, the Olympic Committee must exercise a strong overseeing responsibility.